Reading this book is genuinely one of the best decisions I’ve made in a long while. Those who know me, know I generally don’t give Christian books the time of day, just because I question what they could possibly have to say that I can’t read in my Bible. To my fellow sceptic, Christian Books are not the enemy . If ‘Battlefield of the Mind’ is anything to go by, they aren’t adding anything to scripture, they are merely explaining what the Bible says and giving their own interpretation. Basically a sermon that you read. Anyway, I’m rambling but I just wanted to say thank you God for allowing me to discover the blessing that can be found in reading the words of those that walk with you also, and thank you Joyce Meyer for writing such an amazing book. What I learnt about the mind: Why mind control, why me? I’ve always knows that what goes on in the mind is important, but Joyce has opened my eyes to just how HUGELY important it is. First of all, Joyce highlights that the mind is where the devil will attack us. I know we don’t like to think about the devil but the devil is just as real as God and as soon as you decided to root for #Team-Jesus, you and the devil became enemies. Is this scaring you? I hope not, but if you are feeling a slight chill, you’ll appreciate just how important it is to know how to win the battlefield of the mind. We learn that the devil puts strongholds in our minds; these are lies that he’s told us that we’ve bought into and are now affecting what we believe and how we act. However, our three spiritual weapons are: The Word, praise, and prayer. Really it all comes down to knowing God’s word to the point of being able to say it back to him. As Joyce puts it “God’s word and our need is the basis which we come to him.” Still with me? I shall summarise. There’s a battle, it’s you against the devil and it’s being fought in your mind. The devil comes with his A-Game trying to attack you with strongholds that he places in your mind. Your weapons are the very words of God. What I learnt about myself: I have a judgemental mind. We judge people because we think we’re better than them. That’s a bit hard to stomach isn’t it?! Simply put ‘Judgement and criticism are fruit of a deeper problem-pride’ EEK! Using Romans 12:3 which tells us quite simply not to get gassed (think too much of ourselves) Joyce highlights that when we have an exaggerated opinion of ourselves, it causes us to look down on others and value them as ‘less than’ us. Needless to say, this is not good. Galatians 6:1-3 Says that we’re supposed to help people that have gone off track without any sense of superiority. We are supposed to carry each other’s burdens and whilst helping them, be mindful that we don’t get tempted to join them in the sin. If we’re so busy gossiping about people’s problems and ostracising people because we’re shocked at the sins they’ve committed we’ll forget to offer the helping hand to pull them out of it. We are one body in Christ. Imagine if every time a part of us was sick the heart just stopped pumping blood to that region so that it eventually lost all connection with the body and died. Sounds so ridiculous but that’s what we do to ourselves when we judge instead of showing love. Instead, when we hurt ourselves our body pumps extra blood there and starts fixing itself. I know I’ve just given you a very badly remembered version of GCSE Biology but you catch my drift I hope. Not to them, but to you! Judging others is literally like praying ‘return to sender prayers’ on yourself. For all the non-Africans reading, it’s like cursing yourself then saying, whoever curses me shall be cursed, but you were doing the cursing so it’s all coming back to you. Do you get it, or have I just confused you? Romans 2:1 says we shouldn’t judge others because in doing so we condemn ourselves. I hope that makes what I was trying to say clear. There’s just no benefit in criticising others and if this is where your mind is at, don’t accept it as ‘ok’ or ‘just another part of your personality.’ We need to use The Word to fight against the judgemental thoughts that creep in! We’re so used to thinking a hundred things at once that we’ve become desensitised to it, but this is not a safe land to live in. God wants your attention and to give you the guidance you NEED to live life. How are you supposed to hear him over all the other voices competing for your time? So here’s what I gathered. The Holy Spirit is trying to communicate God’s message to us. He deposits it in our spirit, and then in order for us to understand what that message is practically, our mind and our spirit have to be aligned ( in one accord, speaking the same language, basically both besties with God and the things of God). For someone who loves breaking down arguments and just generally thinking, this was a bit of a shocker. What I think is important is that we don’t try and use human logic to understand scripture but instead allow the Holy Spirit to give us the interpretation. This does make sense, because it’s so easy to dismiss what God’s saying because we don’t think understand it, but He is the same God who told Abraham to kill Isaac, and then not to kill him because He wanted to see if Abraham would obey him. You don’t always have to get why God is asking, just be willing to obey. I half joke, but in all seriousness worry adds nothing. It can’t make you taller, put food on the table or pay your bills so why bother? Save your time and pray about the things that bring you stress! This book is perfect for anyone who is Christian and has thoughts. In other words, yes! Purchase! 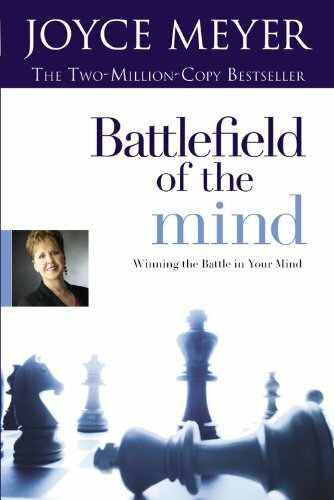 Joyce beautifully unpacks The Word and directs you to the scriptures that will prepare you for the battlefield of the mind. I couldn’t possibly write all the things I’ve learnt in one post; grab your own copy so that you can learn how to fight your own battle. If we’re going to fight, we might as well fight to win.